1994 F1 Driver’s Championship1st. 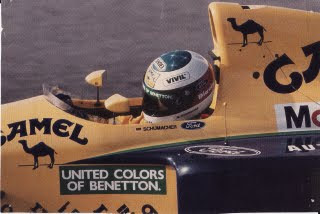 Michael Schumacher; Benetton-Ford, 92pts. 2nd. Damon Hill; Williams-Renault, 91pts. I can recall less “N less from that fateful year of 1994, (minus “Black Sunday,” a.k.a the Imola weekend & Karl Wendlinger’s ensuing accident at Monaco) except for the ecstatic reaction I received in Monterey, CA for wearing a Michael Schumacher Camel Benetton T-Shirt at the Monterey Visitor’s Center while trying to learn where all of the action was during my first foray to the Monterey Historics, as the German Fraulein gushed over my Benetton T-Shirt, even going so far as to ask me where I got it; do you wanna sell it? Sitting there dumbfounded and shrieking over Herr Schumacher’s collision with arch nemesis (enemy) Damion Hill… As clearly the “Terminator” put his soon to be patented “Schumi Swerve” upon the unsuspecting(?) Brit, which would lead to his very first Formula 1 Drivers World Championship being cemented in Adelaide, Australia 15yrs ago, (yesterday) as I screamed in jubilation as Schuey had done it! Besting Hill by a single point with the two rivals being 50 points clear of third place Gerhard Berger; SHEISA! Although one could argue he wasn’t so successful in ’97 trying to give Jacques Villeneuve his patented ‘LUV-tap, eh? Aye Karumba! As the pantheon of Formula One’s greatest Piloto’s; Mansell, Piquet, Prost and Senna had all left the scene, albeit Mansell’s brief return to breech the massive void left by Senna’s untimely demise… And thus I suppose its most ironic that Michael Schumacher’s very first career pole position didn’t occur until after Ayrton’s death at Imola, as Hakkinen battled royale against the TERMINATOR for Pole position at Monte Carlo a Fortnight later.